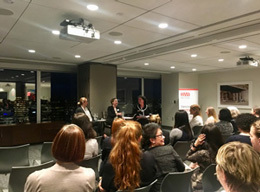 At our February Fireside Chat, we had the pleasure of hosting Diana Pavlovska, Consultant for The Humphrey Group and Janina Heuser, Client Service Director at Robert Half Management Resources, for a dynamic and laughter-filled fireside chat on leadership communication. 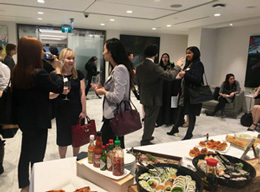 The evening event of networking and conversation was moderated by Terri Dickson, AWF Director and Wealth Advisor & Associate Portfolio Manager at RBC Dominion Securities Inc., and generously sponsored and hosted by RBC Dominion Securities with our guests treated to appetizers and drinks - courtesy of our co-sponsor, Fidelity Investments. Diana and Janina drew on their personal consulting experience and quickly came to an agreement that leadership and the ability to communicate are essentially one and the same. According to Diana, to become an effective leader who drives ideas and inspires action, women must build the confidence to know themselves, particularly their personal goals and purpose. It is with this self-awareness that women can build a foundation from which they can clearly, concisely and confidently communicate. Janina pointed out that women typically do not market themselves, or their achievements, believing that their qualities and accomplishments will speak for themselves. Instead, she insisted, women should seize opportunities to become their own self-promoters and confidently vocalize the value that they bring to their organizations. Be it in an interview, a presentation or while working within a team, women should be ready to effectively communicate their ideas, opinions and feedback, thereby demonstrating their ability to lead. Based on their experience of working with professionals (including C-suite executives), our speakers shared a few key pieces of advice. Janina urged attendees to find both a mentor (not necessarily a member of their organization) who can guide and provide constructive feedback, and a sponsor within their organization to help promote their ambitions and goals. Diana encouraged women to think strategically about their goals; to create their own personal vision with clarity around as to what value they can provide and what they are willing to give up (and not) to achieve their goals. 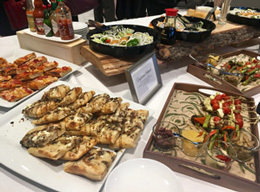 As always, thank you to our sponsor, RBC Dominion Securities, and co-sponsor, Fidelity Investments, to our guest speakers, moderator and wonderful audience for another memorable event.